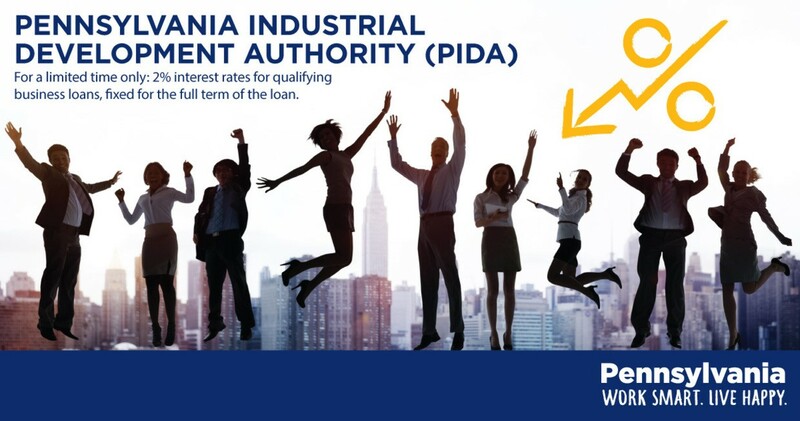 The Pennsylvania Industrial Development Authority (PIDA) is pleased to announce that for a limited time, it is offering loans at a 2% interest rate, fixed for the full term of the loan to qualifying businesses. Established in 1956, PIDA is a component unit of the PA Department of Community and Economic Development and provides low-interest loans and lines of credit through certified economic development organizations (CEDOs) for eligible businesses that commit to creating and/or retaining jobs, as well as for the development of industrial parks and multi-tenant facilities. ACT NOW! To take advantage of this limited-time opportunity and to learn more about the program, please visit dced.pa.gov/PIDA.